Supplied in 1808 to George, Prince of Wales, later King George IV (1820-1830), for The Throne Room (which became the Ante Room to the new Throne Room in 1811) at Carlton House, London. Removed in 1820. Subsequently acquired (before 1934) by Professor Sir Albert Richardson, P.R.A. W.H. Pyne, The History of the Royal Residences, London, 1819, vol. III, opp. p. 28. R.W. Symonds, 'The 1815 Room', Homes and Gardens, June 1924. C.E.C. Tattersall, A History of British Carpets, Benfleet, 1924, noted on p. 120. S. Houfe, Sir Albert Richardson, the Professor, Luton, 1980, pp. 131-133. J. Cornforth, The Search for a Style: Country Life and Architecture, 1897-1935, London, 1988, pl. 259, p. 253. Carlton House, The Past Glories of George IV's Palace, Exhibition Cat., 1991-1992, p. 217, fig. 194. 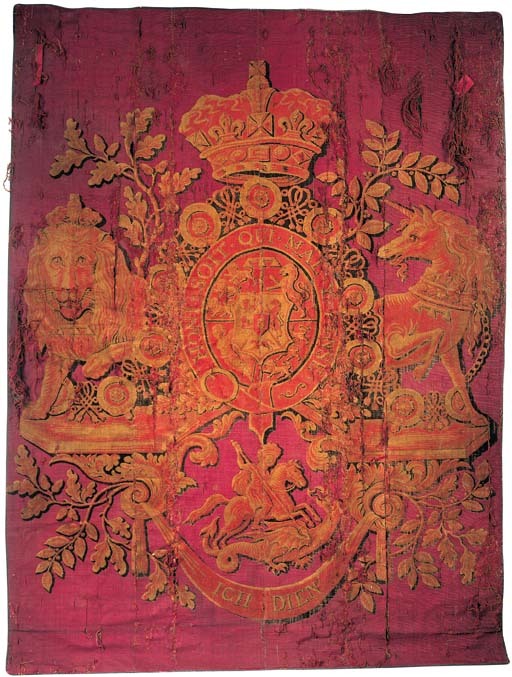 The crimson and gold heraldic carpet, of which the present lot is the central panel, was commissioned by George, Prince of Wales, later George IV for the Throne Room in his Carlton House palace in 1808. It was designed with the Prince's oak and laurel wreathed coat of arms emblazoned in the centre and forming the focal point of the Old Throne Room with its chivalric and crimson decorations. The prince's heraldic badge may have been designed by Thomas Willement (d. 1871), whom the Prince appointed as his heraldic artist. George III had recently expanded the institution of the Order of the Garter, whose constitution had been limited to a statutory twenty-five Knights Companions. In 1805 it was declared that the Prince of Wales was no longer part of that number, but was to be considered "a constituent part of the original institution". The carpet was executed by Messrs Joseph Baker & Son and invoiced in June 1808 as 'An Extra Superfine Imperial Brussels Carpet ... Crimson Ground, with a Superb Embossed Centre, consisting of His Royal Highnesses Coat of Arms curiously wrought in Rich Gold Colours, made to cover the Throne Room complete...' (RA 2512) (Carlton House, The Past Glories of George IV's Palace, Exhibition Catalogue, London, 1991-2, pp. 216-7). In the original room design, the present magnificent golden armorial was sited before the throne beneath a crystal chandelier. This served to compliment the gilded overdoors displaying the British Orders of Chivalry granted to the Prince, namely the Garter, St. Andrew, St. Patrick, and the Order of the Bath. In addition there were three other carved triumphal tablets; these were set above the chimneypiece, a facing mirror and above the pier glass.